I discovered this place where I can get nice dog and cat toys at a good discount. I actually went in to get some new drinking glasses, because too many have broken and I needed new ones (but I digress). 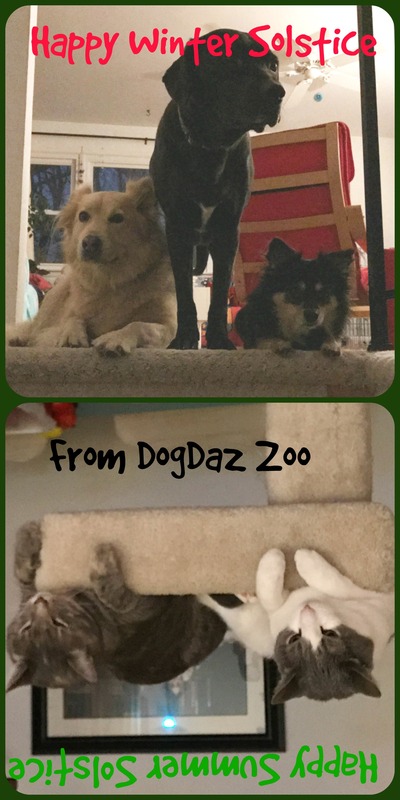 Knowing my charges as I do, Louise got a stuffing-less Squeaky Skunk, Sofie got a flat bat looking thing that crinkles, and Mr. Charles got a rope and ball. They were so excited and each played with their respective gifts for about 10 minutes. Then, we went outside for a while. 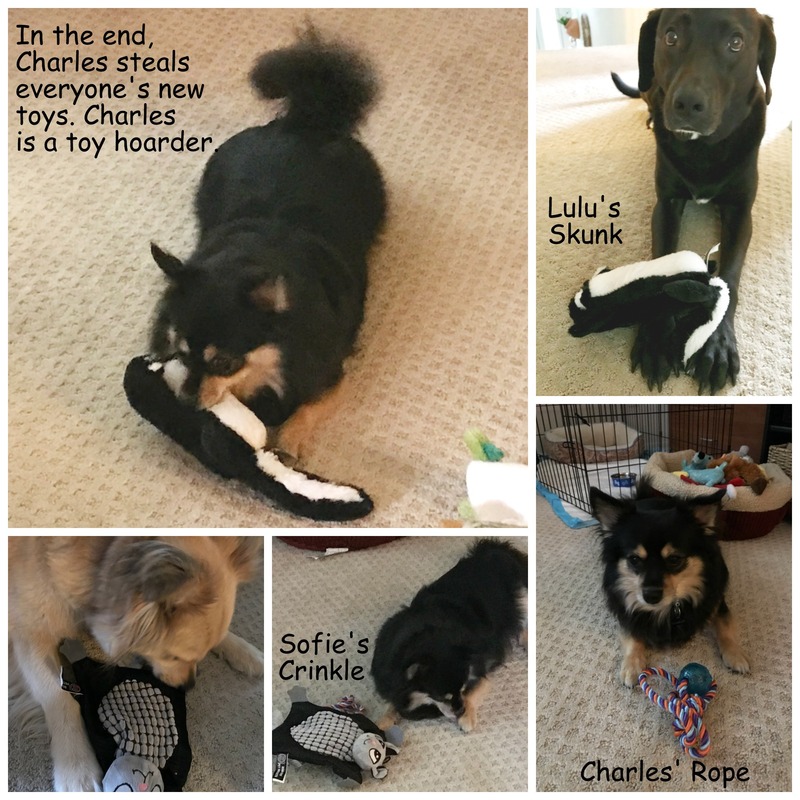 When we returned to the living room, Charles started doing what he does best – toy hoarding. First, he stole Sofie’s crinkle thing – she was distracted so she didn’t put up a fuss. Then he moved onto Louise’s skunk (which appears to be his new favorite). Louise was a bit unhappy, so she went over to her pillow and moped until I rescued skunk and gave it back to her. The other dogs’ toys are always more fun. Charles ends up sitting on a pile of everyone’s toys so only he has them. I don’t really need a weather app on my phone to tell me a thunderstorm is coming. 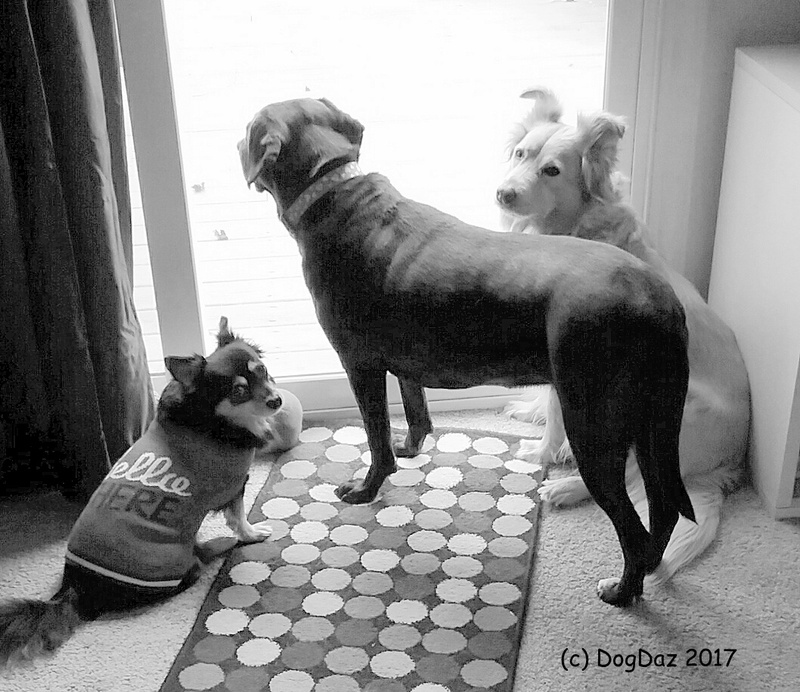 Here at DogDaz Storm Center, we have 2 main thunder warning systems – Louise and Sofie. In the middle of the night last Monday, some how, Louise managed to unlock her kennel, by herself, and come upstairs and start breathing on my while I slept. Then Sofie, who rarely comes on my bed, pushed me away from my pillows and hunkered down in my spot. It sounded like a freight train coming through the house and the flash and clap were immediate. Amazingly, 15 minutes later an EF2 tornado touched down on the other shore of the Chesapeake Bay on Kent Island (I’m the Western Shore and that is called the Eastern Shore). It started as a waterspout and took full tornado strength (125 mph winds) quickly. Thankfully, though there was a lot of property damage, only 1 person was slightly hurt. 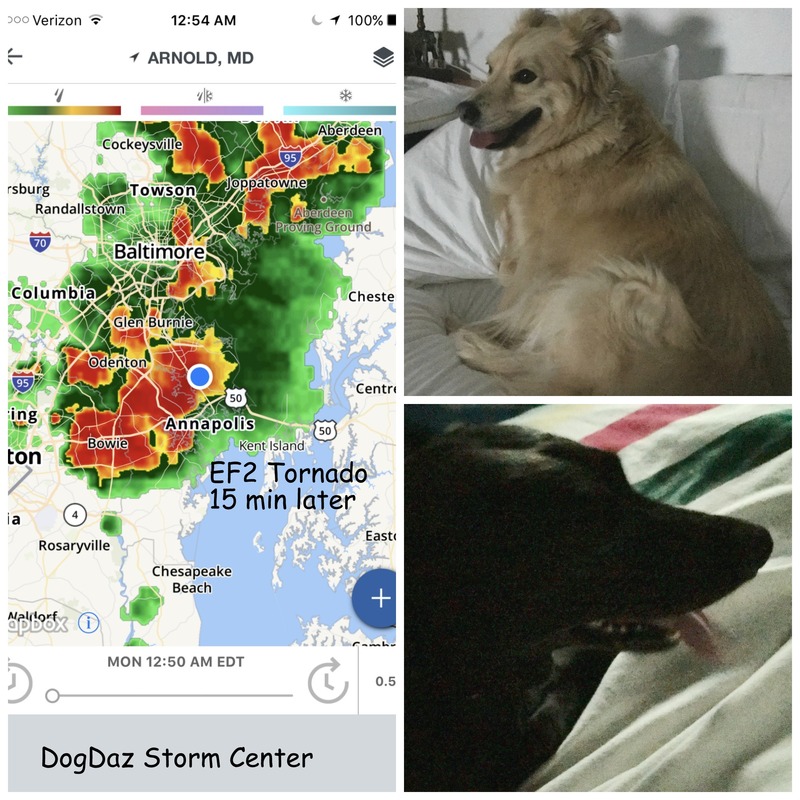 Who needs all those meteorologists when you have 2 dogs that can tell you at least 2 hours before something major happens that something is going to happen? Do you really need to know more than that? Get to cover!!!! Lucky for me, Charlies seems fine through the storms and the cats don’t show me much anxiety. These 2 big babies take enough attention for the whole Zoo. Foot note: They are both huddled under my desk as I type this because yet another storm is passing through. This is summer on the Chesapeake Bay. Oh, my! A memorable moment from 2013 (above). 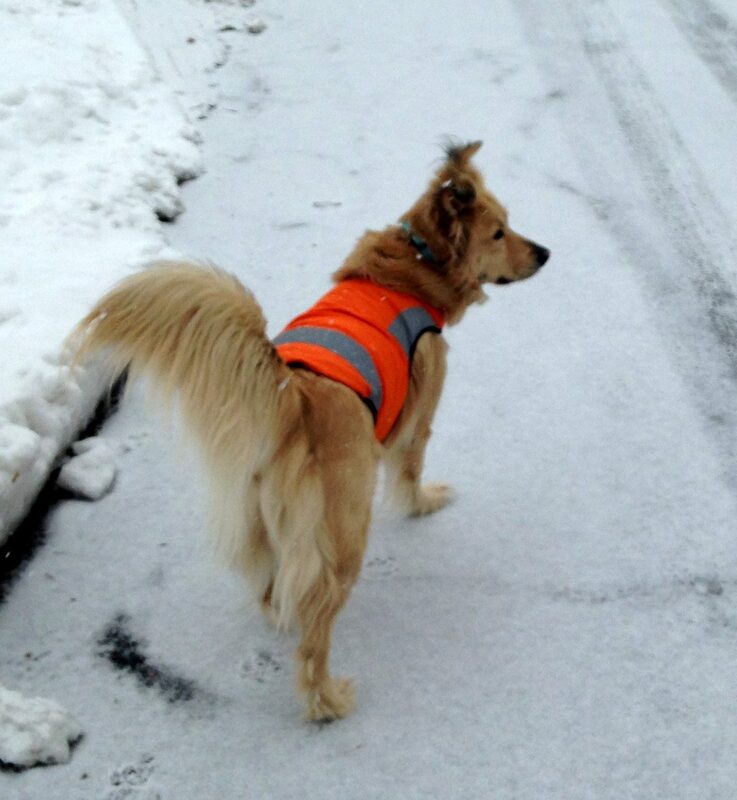 Sofie was only 2 (Lu was 3) and it appears from this shot that her full coat had not come in yet (she looks adolescent from the back). 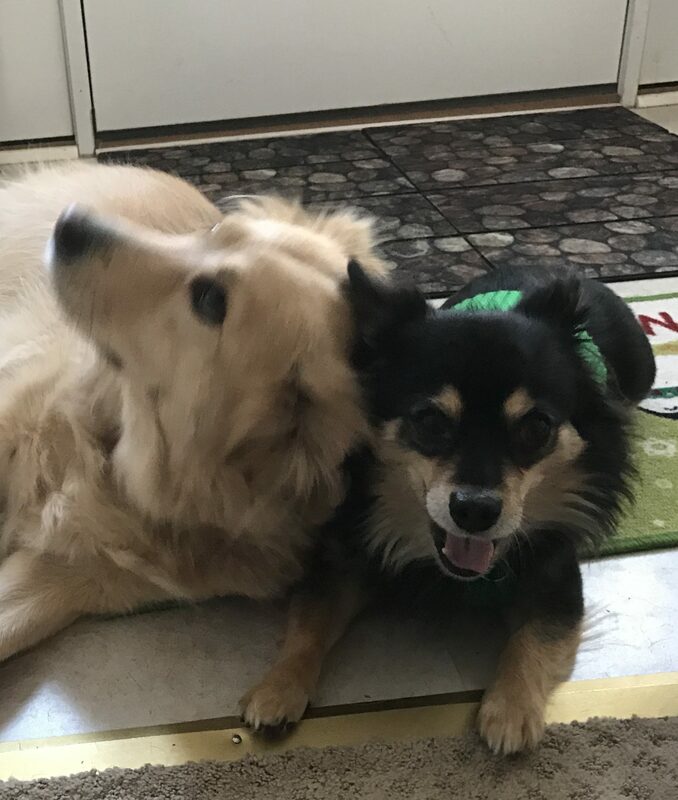 Louise and Sofie always wait by the back door to go chase squirrels and birds. And you can see that not a lot has changed at the back door in 4 years (Oh my, I just noticed that the curtains do look older). 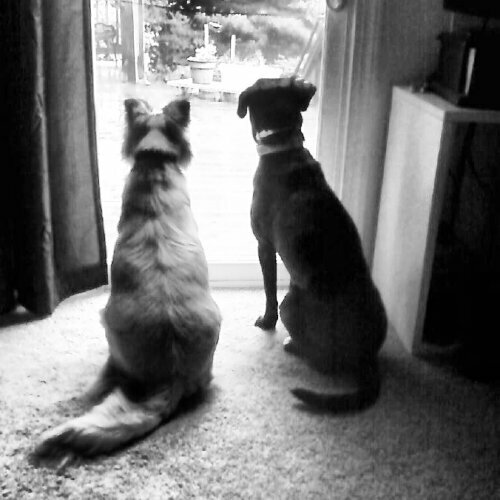 Louise and Sofie still wait to chase the squirrels and birds, except now Charles is with them. It is fun to compare how they looked then and now. 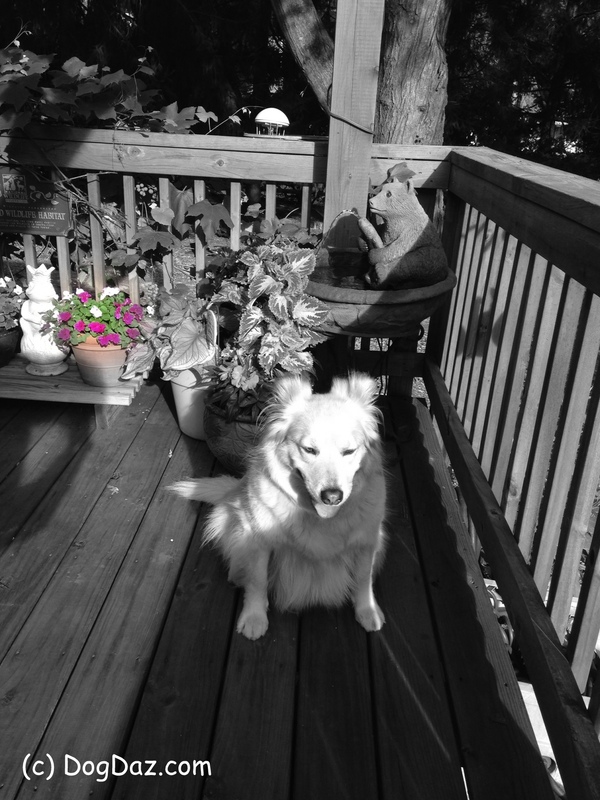 Hope you have a wonderful, romping, Black and White Sunday! 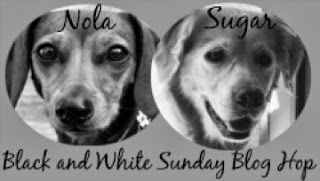 I used to be part of the Black and White Sunday Blog Hop but Dachshund Nola has taken a break from blogging and Sugar jumped over the rainbow bridge and Golden Woofs, though still blogging, is no longer hosting the Hop. I can’t host Hops because of my infrastructure. Can you? Sofie was marking Charles. His expression is priceless. This is a Wordless Wednesday Blog Hop. Thanks to BlogPaws for the hop. Head over there and see what they are blogging about. It was raining cats and dogs and Mom was concerned because Charles did not have a raincoat. 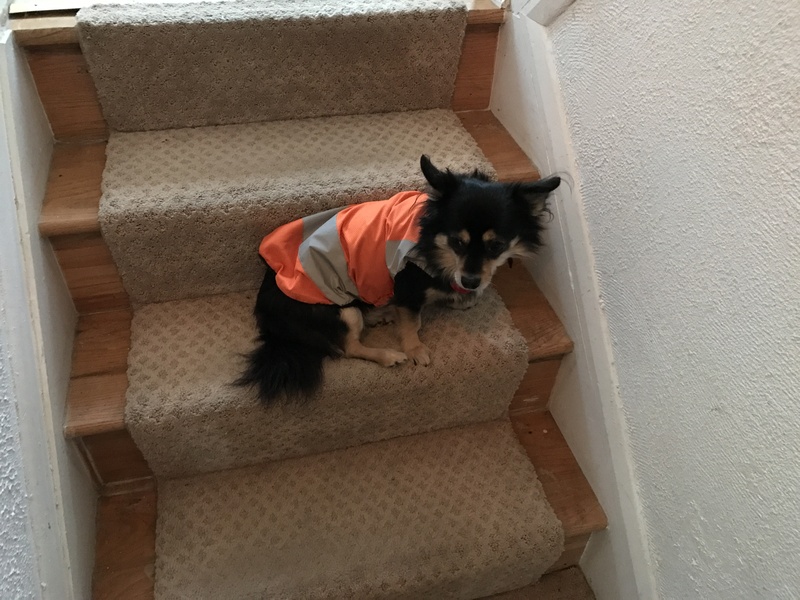 So she took my old raincoat and turned it into a teeny tiny version of what it used to be. (She can be clever like that sometimes.) But now Charles can walk in the rain with us. I don’t understand why the pest has to come everywhere Louise and I go?!!! Couldn’t she just let him stay home? 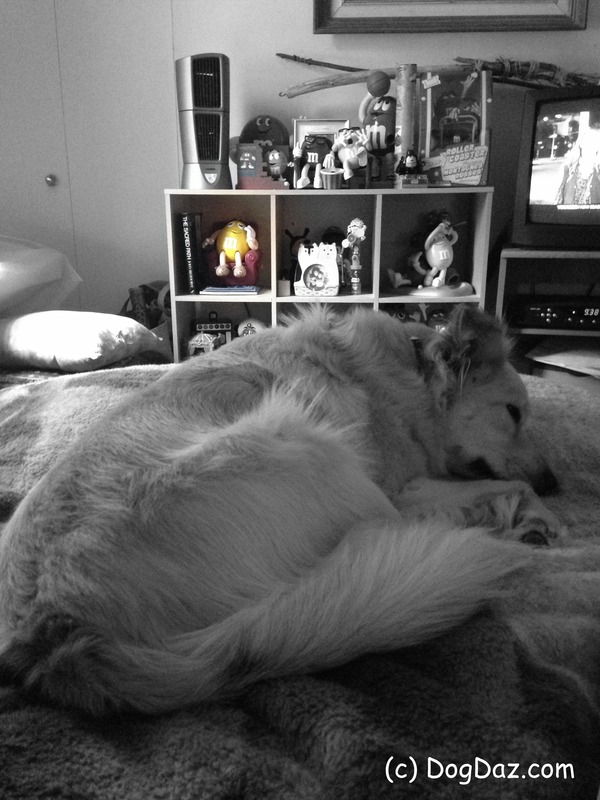 Sofie taking a Sunday snooze in the den with the Mom’s M&M collection.